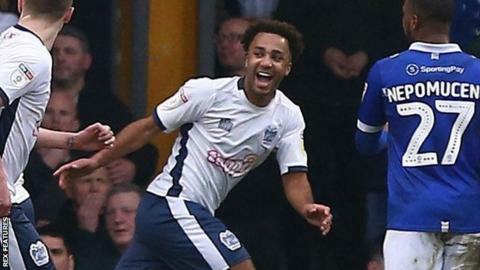 Nicky Maynard scored a second-half brace as Bury came from behind to beat derby rivals Oldham 3-1 in what was a pulsating League Two clash. The bragging rights went to the promotion-chasing Shakers, who remain unbeaten since Boxing Day thanks to a deserved win against Paul Scholes' side. The visitors struck after just eight minutes at a packed Gigg Lane. Jose Baxter dragged a low cross back into the path of Callum Lang, and the Wigan loanee forced the ball home from inside the six-yard box. The stunned hosts ought to have levelled almost immediately, but Nicky Adams scooped over from 12 yards as he charged in to meet Byron Moore's cross. Bury went even closer when Latics' skipper Peter Clarke cleared Callum McFadzean's effort off the line, with Moore then somehow firing the rebound over the top from eight yards. Oldham created the first chance of the second period with young loanee Zak Dearnley firing in a 20-yard drive which Joe Murphy saved well. Bury levelled after 72 minutes. McFadzean crossed in low from the left and there was the predatory Maynard, who bundled the ball home. Five minutes later the game was turned on its head when the Shakers struck again as Jay O'Shea charged in to meet Adams' cross and lashed the ball clinically into the roof of the net. Maynard made it 3-1 late on as he nipped in front of a dithering George Edmundson to tap home from two yards out and seal the win. Match report supplied by Press Association. Match ends, Bury 3, Oldham Athletic 1. Second Half ends, Bury 3, Oldham Athletic 1. Foul by Byron Moore (Bury). Rob Hunt (Oldham Athletic) wins a free kick on the left wing. Attempt missed. Peter Clarke (Oldham Athletic) left footed shot from the centre of the box is too high. Johan Branger (Oldham Athletic) wins a free kick on the left wing. Substitution, Bury. Gold Omotayo replaces Nicky Maynard. Goal! Bury 3, Oldham Athletic 1. Nicky Maynard (Bury) right footed shot from very close range to the centre of the goal. Hand ball by Will Aimson (Bury). Substitution, Oldham Athletic. Giles Coke replaces Mohammed Maouche. Attempt missed. Rob Hunt (Oldham Athletic) left footed shot from the right side of the box is too high. Substitution, Oldham Athletic. Chris O'Grady replaces Christopher Missilou. Goal! Bury 2, Oldham Athletic 1. Jay O'Shea (Bury) right footed shot from very close range to the centre of the goal. Assisted by Nicky Adams. Substitution, Oldham Athletic. Oladapo Afolayan replaces Zachary Dearnley. Peter Clarke (Oldham Athletic) is shown the yellow card for hand ball. Goal! Bury 1, Oldham Athletic 1. Nicky Maynard (Bury) left footed shot from very close range to the centre of the goal. Corner, Bury. Conceded by Gevaro Nepomuceno. Jose Baxter (Oldham Athletic) is shown the yellow card for a bad foul. Attempt blocked. Jordan Rossiter (Bury) right footed shot from outside the box is blocked. Corner, Oldham Athletic. Conceded by Callum McFadzean. Attempt missed. Adam Thompson (Bury) right footed shot from the centre of the box misses to the left. Corner, Bury. Conceded by Peter Clarke. Attempt saved. Byron Moore (Bury) left footed shot from a difficult angle on the left is saved in the bottom left corner. Substitution, Bury. Caolan Lavery replaces Chris Stokes. Nicky Maynard (Bury) wins a free kick in the attacking half.